6 in TSN VertiClip SL Clips at Cowtown Materials, Inc.
VertiClip® SL connects the exterior curtain wall studs at head of wall to the building frame while allowing for vertical deflection of the structure up to 1½” (¾” up and down). 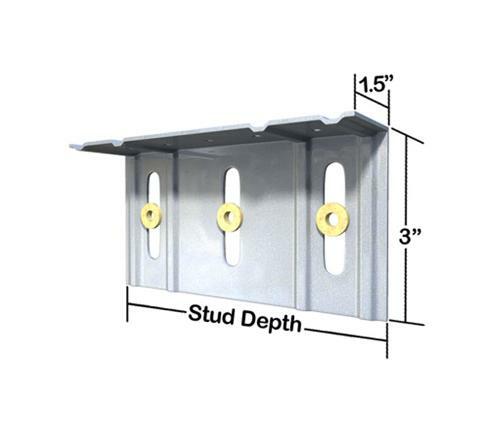 VertiClip’s unique design provides both an anti-friction and anti-seizure connection between the clip and the stud web surface thereby preventing a transfer of vertical forces into curtain wall framing, which is not engineered to support axial loads. Use of VertiClip SL over friction-fit track assemblies helps protect liability through the utilization of positive mechanical attachments to the web of the stud. VertiClip SL is a component of VertiTrack® VTX, our preassembled deflection track. Allowable loads are based on use of two #12 screws for attachment to stud (provided by TSN).